‘Heeray sastay mul de wekhay’ by Bulleh Shah is a lyrical sharing with the readers of what Bullah himself experienced in his lifetime. Several saintly books have we gone through and many a thought provoking readings there might be on the book shelves, but there in only one Bulleh Shah; he shares with pure essence of the matter without invoking secondary or sub-branches of the themes he discusses. He begins by telling us that often times even the best of people don’t fit into the world and they cannot earn affluence; the world manhandles their genius and we find them worthless. Ruby, a red coloured priceless stone; Bulleh Shah tells, is often seen traded for pennies. Delicate flowers, regarded for beauty and softness, are seldom seen torn under the feet of selfish and cruel. Similarly, so many wise people have forgotten their path. The world is full of colours; and every person though of one colour has several shades, quite different from the ones they pose apparently to the world. He tells us that he has led a life of adversity and poverty; he consoles himself with the words that Bullha is a common and average human being, it does not matter if he has been destroyed by the world; the world has ruined people far better than Bullah. He relates the downfall of kings that died penniless. So, Bulleh Shah wishes to teach us that the riches we can not lose are the riches and jewels of knowledge inspired by spirituality. 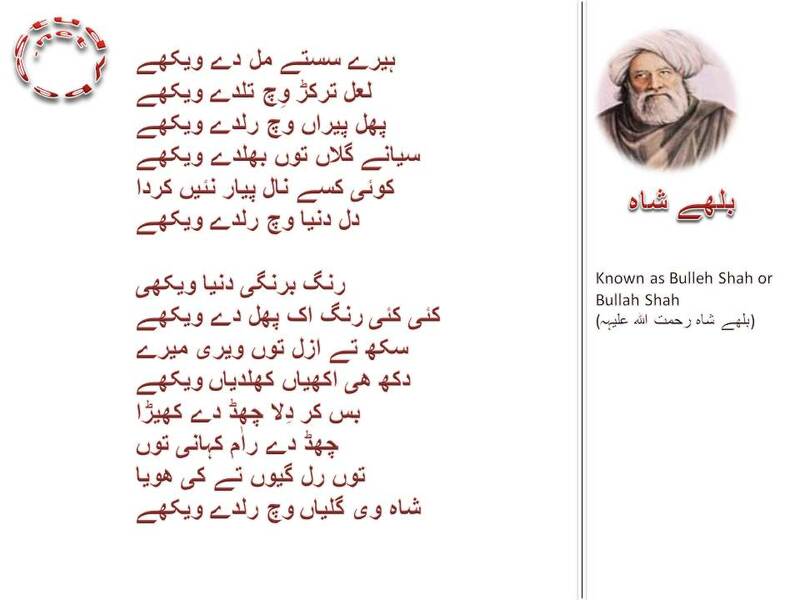 So, Bulleh Shah would invite us to join his lineage of Sufism to spread the words around.